Established in 1795, the Village of South Lebanon is over 200 years old. The Village was originally known as Deerfield and is one of the oldest towns in Warren County, with a rich and vibrant history. At the beginning of the 19th century Deerfield was the most important place on the Little Miami above Columbia. A trail ran from Columbia to Deerfield which became Columbia Road. It was made a stopping place for many of the early settlers in different parts of the county. Early emigrants frequently left their families at Deerfield while the first improvements were being made on their new farms. Captain Ephraim Kibby, Capt. Nathan Kelly, Gen. David Sutton, and Andrew Lytle were among the early permanent settlers at Deerfield. William Snook came from New Jersey in 1801 and the following year his brother, John M. Snook also settled there. The latter was a Captain in the War of 1812. Snook Road is named after that family. General David Sutton for many years was the best known citizen. He kept one of the first taverns in Deerfield and at his house elections for Deerfield Township were held both under the Territorial and early State governments. Sixteen men voted at the first election. Upon the organization of Warren County he was appointed the first Clerk of Courts and held that position for twelve years. When the War of 1812 began he raised a company and went into the service of the government as Captain in the first army that was raised in Ohio. He soon after was elected Colonel at Urbana. He was for many years a General of the militia. Ephraim Kibbey served in the Continental Army during the Revolutionary War. He was a surveyor and member of Northwest Territory legislature. He was an Ohio state representative from 1803-1804. Most of South Lebanon is located in the highly ranked Kings School system. When the King family came to Warren County from Xenia they lived in South Lebanon for several years while the company owned town of Kings Mills was being laid out and the Powder Mills were being constructed. Ahimaaz King purchased considerable land in South Lebanon and their last child was born in South Lebanon. After King built a mansion in Kings Mills he got permission to have his own school system. He built a large eight room school on Kings Mills Road around 1888 when one room schools were the norm. In time South Lebanon chose to become part of that system. A few years ago South Lebanon elementary in the heart of South Lebanon was closed and a new South Lebanon school was built on Highway 48 near the TPC golf course. Ahimaaz King and his wife, Amanda, are buried in the beautiful Deerfield Cemetery high on the hill in South Lebanon along with several of their children. It is the resting place for many Warren county pioneers. Today South Lebanon is working to preserve its history while expanding and revitalizing to become an economic power south of the I-71 interchange. A major retail complex, “River’s Crossing” is underway bringing jobs, services and family entertainment to the area. House built in South Lebanon, Ohio in 1795-1796 for General David Sutton which later became an inn. Ownership passed to a Harry Harding before being torn down in 1964. 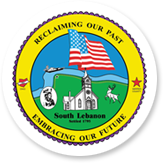 For more information on the history of South Lebanon, visit the South Lebanon Historical Society website.